JP Rio Grande over ECR Eteranal Tari. Wow. What a pedigree. Her half sister sired by Wyoming Warpaint is right at 90" TTT that is owned by JBR Longhorns LLC. 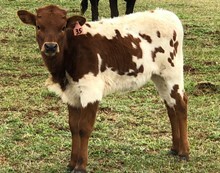 We love the first calf we have off of Shamrock Eternal Legacy. Huge future her.